Pink topaz is often called Imperial Topaz because it was a favorite of Russian kings and queens during the 18th and 19th century. There is no other stone that carries the brilliant bright pink of this stone. Not only is the pink topaz a symbol of royalty the 10 sparkling prong set diamonds that total 1.0 carat surround the 8mm pink topaz are like a crown to the center stone. Any woman will feel like a queen while wearing this ring. 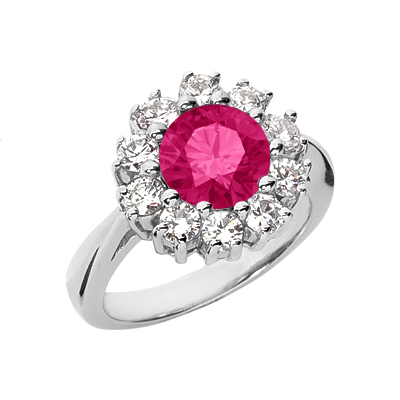 The setting is made of bright white rhodium plated 14K White Gold to make sure the pink topaz and diamonds stand out. This ring will surely be a favorite in any lady's jewelry box. We guarantee our Pink Topaz Flower Diamond Halo Ring in 14K White Gold to be high quality, authentic jewelry, as described above.